For one thing, white peat is not white in colour but yel­low-brown. The decom­po­si­ti­on of vege­ta­ble mat­ter is not par­ti­cu­lar­ly advan­ced, and the plant resi­du­es are still clear­ly visi­ble. White peat forms the upper­most lay­er of the bog and is, the­re­fo­re, expo­sed to only very low pres­su­re, so that the degree of com­pac­tion is small. This peat, which (geo­lo­gi­cal­ly speaking) has been depo­si­ted most recent­ly, is obtai­ned using a varie­ty of tech­ni­ques. For examp­le, the method used by Klasmann-Deilmann is that of sod-cut peat and sur­face-mil­led peat extrac­tion. 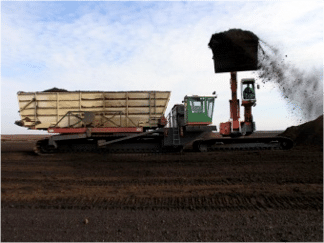 The white peat is then frac­tion­ed using modern star screens into dif­fe­rent par­ti­cle sizes ran­ging from very fine to coar­se. White peat is, like black peat, cha­rac­te­ri­sed by a low pH value of bet­ween around 3.0 and 4.0, as well as excel­lent water and air sto­rage. White peat is one of the most important sub­stra­te con­sti­tu­ents in com­mer­ci­al hor­ti­cul­tu­re. Black peat is the deepest and oldest lay­er in peat bogs. Over the cen­tu­ries, the con­si­dera­ble pres­su­re exer­ted by the upper lay­ers leads to a high degree of com­pac­tion, with black peat appre­cia­b­ly more com­pact than the loo­ser white peat. The vege­ta­ble remains are bare­ly reco­gnis­able as such, as degra­da­ti­on is far more advan­ced than in the upper peat lay­ers. Black peat is extrac­ted in spring or sum­mer and must be laid out to dry in thin lay­ers pri­or to har­ve­s­ting. Black peat is also an important raw mate­ri­al for gro­wing media. In order that its out­stan­ding pro­per­ties, inclu­ding its mini­mal shrinkage, con­sistent­ly high water capa­ci­ty and opti­mum air capa­ci­ty are ful­ly rea­li­sed, it needs to be fro­zen right through.